What a great appetizer idea and finger food for parties or small family gatherings. 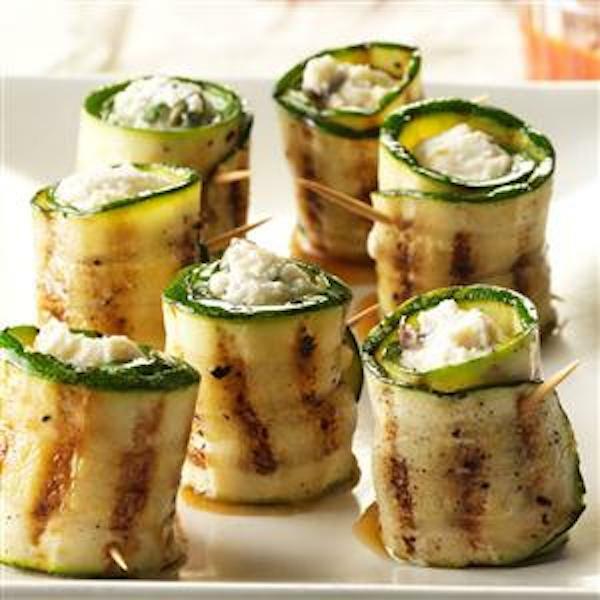 This Grilled Zucchini Wraps With Goat Cheese recipe is simply delicious. This is also super healthy option because the zucchini is filled with goat cheese. Yum! Zucchini and cheese is really the perfect combination. These little zucchini wraps look wonderful at the dinner table and everyone will love them. This recipe uses only 4 ingredients and it is gluten free. Did you know that goat cheese, like goat milk, is easier on the human digestive system and lower in calories, cholesterol and fat than cow products? In addition, goat milk cheese is a good source of calcium, protein, vitamin A, vitamin K, phosphorus, niacin and thiamin. It is really a super healthy option that is also very tasty and goes well with vegetables. Grilled Zucchini Wraps With Goat Cheese are really easy to make. You just need a few ingredients for a healthy, creative and fun appetizer. Just put the zucchini slices on the grill or a large pan at home for just a few minutes, then add the goat cheese and serve your family or guests a homemade appetizer. You can also season your goat cheese with your favorite spices/herbs or buy it already prepared at the supermarket. For this recipe I used parsley and lemon juice but feel free to substitute with whatever you like or simply use a pinch of salt and pepper for a plain version. It is really up to you and your personal taste. You are going to love these little zucchini wraps anyway! If you like zucchini as much as I do, please check out my Healthy Zucchini Carrot Muffins and Cheesy Zucchini Pie. Zucchini is one of my favorite vegetables and I love to incorporate it in many of my recipes. Remember to cook at home using fresh ingredients. Your meals will be healthier and tastier. 4 ingredient recipe that is healthy and delicious. Perfect finger food for parties, snack or appetizer. Slice the zucchini into long strips using a Mandoline Slicer or a Vegetable Peeler. Place on grill pan for about 4 minutes on each side or until tender. Season both side with a pinch of sea salt. Put 1/2 teaspoon of the cheese mixture about 1/2-inch from the end of a zucchini slice. Roll up and place seam side down on a platter. Repeat with the rest of the zucchini slices. 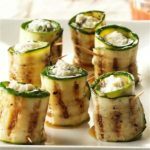 Grilled Zucchini Wraps With Goat Cheese are ready to enjoy! If you are interested in reading more about my blog, please take a look at my latest articles. I am a mom blogger who loves to share creative and healthy fun food ideas. I also share DIYs, cooking hacks, and tips for living a healthy family lifestyle. Would it be possible to have calories included with recipes? Hi, I don’t have the calorie counter application yet. There’s a website where you can enter the ingredients and will tell you the calories and nutrition information. Here’s the link: https://www.caloriecount.com/cc/recipe_analysis.php I entered the ingredients for this recipe and says 33 calories per roll. Hope this helps.